Kait Hauber is a junior at Purdue University studying aerospace and astronautical engineering. She’s also racing in the Purdue Grand Prix on Saturday, April 13. 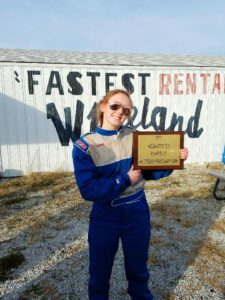 We talked with her about how she got involved with Grand Prix, her decision to attend Purdue, and what it’s like to be a woman in a traditionally male field. What led you to Purdue? I am a junior in aerospace and astronautical engineering from Avon, Indiana. I chose Purdue for a number of reasons, all leading back to the fact that we have one of the best aerospace engineering programs in the world. My mom was in the U.S. Air Force and I have always been a fan of things that go fast (aerospace engineering is kind of the “engineering of fast things”). On top of that, I plan on some day being an astronaut, and what better place to start than the Cradle of Astronauts? What led you to engineering? I always excelled in math and science in school and I took a few engineering classes in high school, which I loved. I enjoy the challenge of creating new ideas and solving problems with unique solutions. How did you get involved with Grand Prix? How many races have you competed in? Living one town over from Speedway, Indiana, caused racing to be a huge part of my life growing up. One of my best friends from home is a couple years older than me, and she was the Grand Prix chair for Society of Women Engineers (SWE) my first year at Purdue. I was hesitant to be involved with Grand Prix at first because I wasn’t confident in my technical abilities, but she kept making me come to practices and I quickly fell in love with the whole thing. My freshman year (2017) I was on the pit crew for the SWE team, and my sophomore year (2018) I was the Grand Prix chair and driver of our second kart. That was the first year SWE ever had two karts on the team, and we both qualified for the race. At one point I was ninth, but my engine blew about 130 laps into the race, and I finished 19th. I will be racing again this year with our brand new kart thanks to a sponsorship from Wabash National. 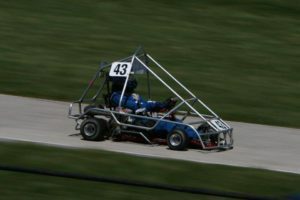 Our other driver will be racing a kart sponsored by Corning Inc. Their sponsorship of SWE dates back to 1974 — the longest-running sponsorship in sports history. Can you talk about the role of mentorship and support, and what that means for women interested in STEM? I think it is very important that successful women engineers offer any help we can to those who are coming after us. Building a foundation for success for young women in STEM is how we change the system that historically has worked against us. Mentoring and role modeling are responsibilities that every woman in STEM should consider. The pool of professionals is much smaller than the number of young women with the desire to participate in STEM. It can be as easy as offering an open email for questions or offering words of encouragement. Additionally, I have had many male mentors in my time at Purdue and during my internships. I think that it is very important that men also show their support for young women entering the field because it creates a stronger sense of unity and cooperation. More broadly, what impact has SWE had on your Purdue career and your success as an engineering student? Being in SWE has — above all — given me the opportunity to work on a regular basis with strong women who have similar goals and aspirations. This experience is inspiring and uplifting because I can see, in a more concentrated environment, the successes of others like me. While I generally feel like I am valued intellectually, sexual harassment in male-dominant workplaces is a problem. I have had negative experiences that were both made worse and mitigated by my superiors, and that is where I believe the change lies. When men who are in charge of other men keep their employees accountable to respect women in the workplace, positive change occurs. Learn more about the race, details, and schedule on the official Grand Prix site.